Last night it happened again! My house was invaded by men and cigars. That happened two nights ago, remember, and when I got home from work yesterday Howard called me up and asked, again, if he could have the boys over. And again I said yes. And in no time at all my home was again filled up with men including Walt and Tom and another gentleman who does not want it mentioned that he was here. Imagine! What am I, Belle Watling? This time around there were two dogs too. And a bottle of strange Jewish plum liquor. I knew I would like it and I did. But I only took one sip. It was awfully strong. That is a dark and smoky picture up above of me with lounge sensation Guy Boleri and Luna, one of our canine guests. Zut alors, my braces! They are all you see when you look at me! Look at Luna instead. She is an obscure breed of dog that comes from the Canary Islands. She has a glossy coat and slinks around the house like a jungle animal. I kept thinking how much she reminded me of a tiger. Here is a picture I took of my new friend Luna. When Luna wanted to go upstairs you did not stop her. I went upstairs looking for her once and she was a big dark shape in the hall. When it came to going back downstairs there was a problem because Luna does not have stairs back home so she does not know how to climb down them. You had to coax her down. Liza is a Chinese dog. Liza guards the perimeter. That is what she was bred to do. So when she naps she always faces away from the gathering. Lastnight she slept with her head toward the dining room in order to prevent encroachment from that direction. She also guarded the coffee table. 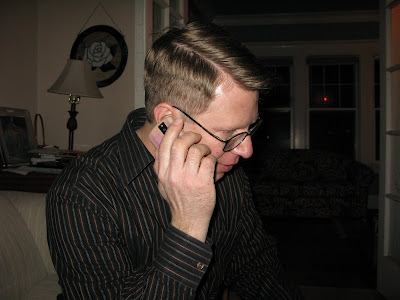 Here is Howard on the phone with Ron Moss who called to see how things were going. Moss would have been here but the wife would not let him out. Howard talking to cab driver Ron Moss while wearing shirt of concert pianist Leonard Pennario. When I came downstairs this morning it was like a few days ago. You did not want to breathe the air in our living room, oh no no no. It was in stark and unholy contrast to the bright beautiful bracing January day outside. But lastnight it was nice, at least up to a point. I am not a big fan of cigarettes but I remember once in Rome with my mother I got a whiff of something spicy and pleasant. My mother, too, stopped and sniffed. "Oh, smell that," she said. "A good cigar." One night in San Diego last winter, Leonard Pennario and I were coming back from one of our many dinners out. I used to love those dinners. Anyway, it was a warm night, what I consider a warm night at least. And like that night in Rome, I caught the scent of a good cigar. "Oh, Leonard, smell that," I said. "A good cigar." Pennario did not want to hear that, oh no no no. He did not like smoke of any kind. I think it came from all his life while he was touring he used to be protective of his health. You know how Glenn Gould used to cancel concerts? He was weak. Pennario was strong. More than once he was called to fill in at the last minute for Glenn Gould. An unexpected treat for the audience! 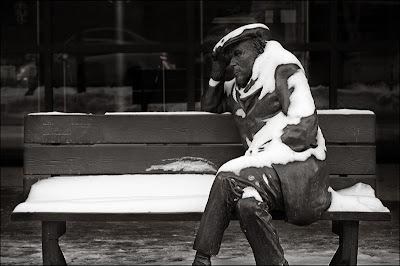 In Toronto they put up a statue of Glenn Gould being weak and not playing. Listen to me, here I go again! I should make myself write 100 times, I will not throw rocks at other pianists. I will not throw rocks at other pianists. That was going to be one of my New Year's resolutions. Well, I have not gotten around to making my New Year's resolutions yet. And at the rate I am going, I will not get there anytime soon. 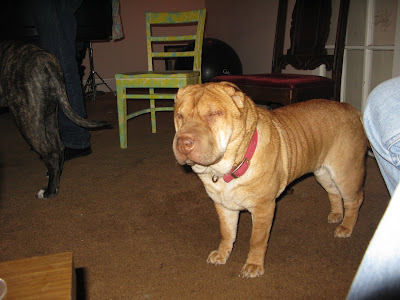 Yes, Liza is a Minature Shar Pei. She is a very well behaved and dignified lady. 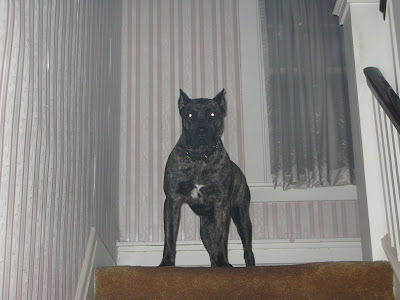 I am a big lover, but the image of Luna on your staircase is right out of "Rosemary's Baby." Run for the hills! I am sure she is a sweet dog -- must be the cigar smoke that's taken up residence i your home that makes her look like the dog from hell. Should have said "big dog lover." Jury still out on big lover! Aren't those Canary Island dogs the kind that killed that woman a number of years back? It was in San Francisco I think. Is that safe to have a dog like that around?